I’m afraid to check and see if any of these fictitious but funny domain names are actually registered. Nor can I speculate why someone would want to reserve such domains other than for sheer humor. Feel free to check their availability. what teh hellz mah new domain name no work! did u actually buy these domain names? Wow these are really funny domain names but non of them available. I actually have DoneWrong.com and have a dream of subdomaining the s*** out of it. This comic is so grotesque and becomes funny as I start to think of terrible domain names I’ve seen around the net in the past. I think the .gov domains are the best, probably because of the fictitious lands (like Mordor) and capacity to be a running joke of a serious sorts. I mean, Anarchy.gov? I’m surprised this is not a thing. Now I’m going to take a step away from my computer and dry to mentally erase my mind with soap as I’ve just had to stare at a picture with a pimple ridden kid and a computer named “Smell.” Thanks much for this early morning surprise! Haha. 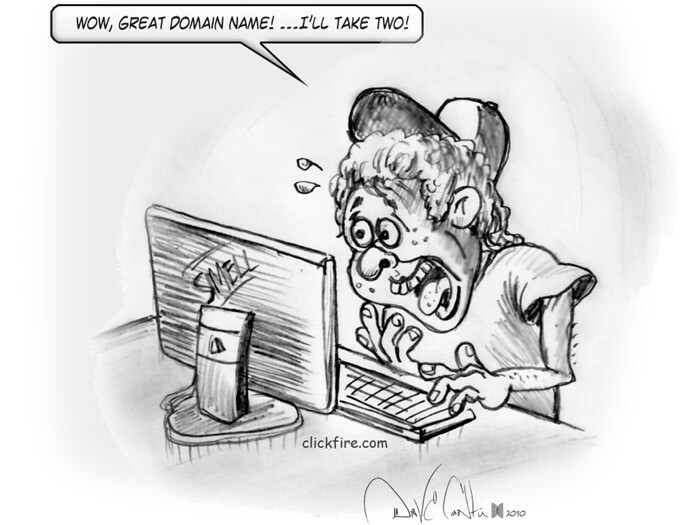 About the comic, I just think the idea that you could buy 2 domains with the exact same name is amusing. Maybe Godaddy will offer that!